Tony Taylor may have graduated, but his time on the court in the District hasn’t come to a close just yet. A new post-college league, the Basketball Alumni Legends League, or The-BALL, is forming, pitting a team of former Philadelphia-area college players against a similar team from the District. Taylor announced he’ll take to the court with the D.C. team for an Aug. 4 showcase in the Smith Center. “Shoutout to @theballhoops for inviting me to play in the dc vs. philly alumni game at the smith center Aug 4th. Will be televised on Comcast,” Taylor tweeted. After the Smith Center showcase, the two teams will play a second game at GW’s A-10 rival Saint Joseph’s. From there, the “new professional basketball league will launch in 2013,” its website reports. Taylor is the lone former Colonial on the listed roster, but the Philadelphia team counts eight former A-10 players among its ranks. 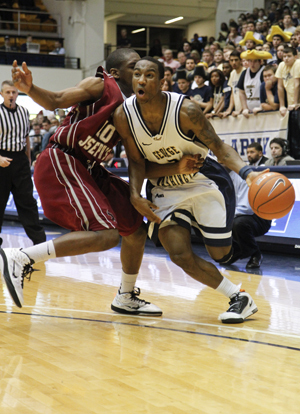 The point guard was a key presence in GW’s lineup during his tenure with the program, culminating in a selection to the A-10 preseason first team before his senior season. Despite a disappointing final season as a Colonial, when the team struggled to shift to head coach Mike Lonergan’s new style of play and exited in the first round of the A-10 tournament, Taylor netted his 1,000th point while in a GW uniform and was named the team’s MVP.